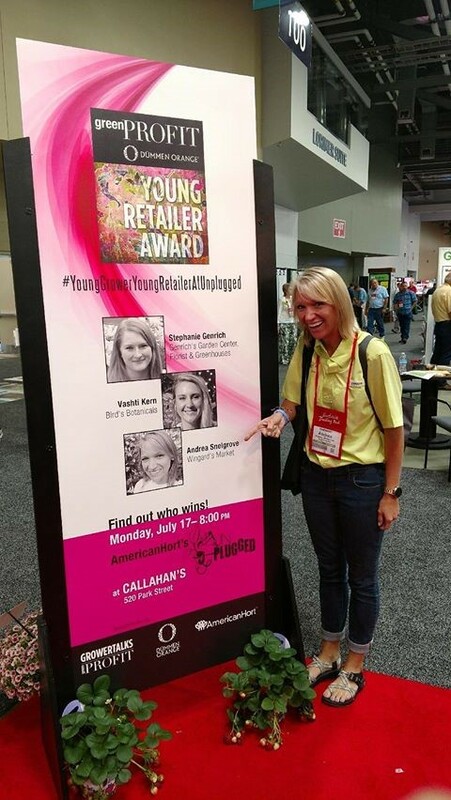 Snelgrove, Gift Shop and Merchandising Manager at Wingard’s Market in Lexington, SC was selected as this year’s recipient of the prestigious award; “Young Retailer of the Year,” presented by Green Profit/Dümmen Orange on July 17, 2017, at the AmericanHort Cultivate‘17 Show, in Columbus, Ohio. LEXINGTON, SC – Since 2006 Green Profit has been looking at 35 and younger retailers who show passion, creativity, leadership and a desire to excel in the garden center business. This year marked the 12th anniversary of the Green Profit Young Retailer Award as it named Andrea Snelgrove, Gift Shoppe and Merchandising Manager of Wingard’s Market, the 2017 Young Retailer of the Year. The competition for this year’s award was tough and the 2017 Profit/Dümmen Orange Young Retailer Award finalists were posed the following question. Snelgrove’s answers clearly described how Wingard’s Market is approaching their future customers. “FOR A SMALL- TO MID-SIZED INDEPENDENT GARDEN CENTER, ATTEMPTING TO DISRUPT THE INDUSTRY WOULD BE AN IMPRACTICAL AND RISKY CHOICE. When companies disrupt industries, it is typically through a form of technology. Many retail businesses have been displaced by companies selling online. While that may happen to some degree in our industry, I believe customers love the atmosphere when they come into our garden centers. Buying everything we offer online would deprive them of the sensory experience we are able to provide. But that does not mean we cannot be innovative and adaptive. Diversification allows us to continue growing and to expand into the markets that interest our current and future customers. There is a new generation that garden centers are seeing called Millennials (age 20-35). There are more Millennials in the population than there are Baby Boomers. I am considered a Millennial, and from what I have observed, our lives are based more on experiences rather than material things. The sensory experience I mentioned before is exactly what our future customer is looking for. The lifestyle of healthy eating is also important to our generation. Garden centers need to embrace how we can diversify our offerings to the future customer. We need to incorporate new technologies that they are accustomed to, i.e., mobile everything, while continuing to give them the experiences they crave. We could not have asked for a more opportune time to think about how diversification can help us grow. About Wingard’s Market – Wingard’s Market is a family oriented business providing outstanding customer service and professional gardening advice to help make you a better gardener. With plants, gifts and fresh produce, Wingard’s Market is becoming Lexington’s favorite local market. It was named in 2015 one of the “Top 100 Revolutionary Garden Centers” by Today’s Garden Center magazine, and Delores Steinhauser was selected as the 2016 Palmetto Center for Women Honors in the Entrepreneur Category. Wingard’s Market is located at 1403 North Lake Drive in Lexington, SC. Call (803) 359-9091 or visit wingardsmarket.com. Sign up to get interesting news and updates from Wingard's. Please confirm your subscription by checking your email and clicking on the link in the email. Hours: Our hours change seasonally. Please check the contact page for our current hours.